Ask Again Later is the kind of book that you'll immediately associate with the word cute. It's the first adjective I thought of when someone asked me for my opinion of the book. You can even tell just by looking at the cover. I honestly had a hard time getting into the story at first. I liked the characters (with the exception of Heart's brother - he's a douche) because they're all so witty and quirky. Especially Heart. She's kickass if you ask me. It had all the elements that make a cute story but I wasn't so amused at first. Heart just had too much bad luck. You see, she had two prom dates. No, she didn't juggle two dates at once. For some reason she was able to go to two proms when she flipped a coin to decide which date she'll go with. Same events happened but a little differently based on who she's with. In addition to that, she somehow gets the feeling of deja vu whenever certain events overlap. Towards the end, the story met at one point. I don't quite understand how it happened but it did. It's confusing but as long as you don't over analyze, you're good. Going back, two prom dates meant twice as much chaos. Something's bound to go wrong on prom night, right? Heart definitely had her share of bad luck... over and over again. I get that it's part of the coin toss magic but it was too repetitive for me. Some parts were really funny (albeit cringe worthy) that I laughed out loud but some were just meh. 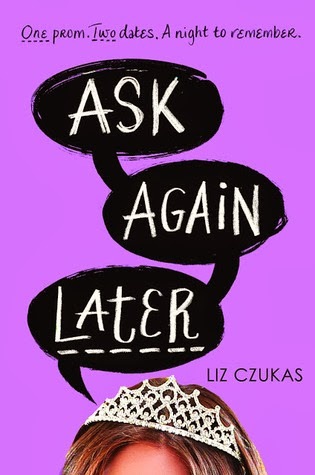 If you're looking for a fun YA contemporary, then you should definitely read Liz Czukas' Ask Again Later. Some parts were a bit cliche but overall it's undeniably enjoyable.